Mae Hong Sorn, one of Thailand's most remote provinces, is situated to the Northwest of Chiang Mai, right on the Myanmar border. With it's cool climate, spectacular scenery and unusual ethnic mix, it is a favorite get-away for Thais and foreigners alike, reachable either by a quick flight from Chiang Mai, or a longish road journey through Pai or Mae Sariang. Mae Hong Sorn town itself sits on a small and picturesque lake. Its laid back pace of life and its beautiful Burmese and Shan influenced temples combine to lend the place an air of mysterious exoticism. Throughout the rest of the province, trees and mountains dominate, and you are as likely to meet Shan, Myanmar, and tribal people as Thais. During the latter part of the year, the hills to the south of Mae Hong Sorn town burst into bloom with 'Bua Thong' flowers, and it is wise to book your hotel in advance, as this amazing site is very popular amongst Thais seeking a weekend in the country. This Shan temple sits on a hill to the West of town, and is a perfect spot to witness the early morning mists which gather in the valley below. 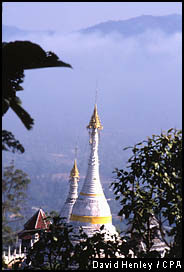 In the grounds of the temple are two white chedi containing the ashes of monks from neighboring Shan State in Myanmar. Next to the lake in the centre of town, these Burmese style temples are particularly elaborate, and very beautiful. Wat Jong Klang contains some antique paintings of religious scenes executed on glass. Between Mae Hong Sorn town and the Myanmar border, and reachable by boat, is a Long Neck Padaung village. Starting from an early age, the women put brass rings around their necks, gradually adding more as they get older to achieve the striking looks held as a mark of beauty by their menfolk.